Hello everybody! Thanks for joining us for another fun and fabulous Your Next Stamp Blog Hop! YNS just released a whole slew of awesome new stamps and dies so the DT (and our awesome guest designer!) have whipped up some eye candy using many of the new images and dies. 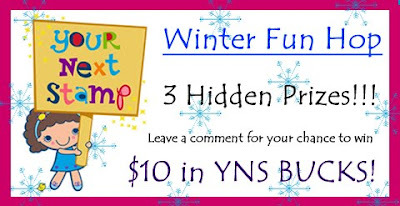 We are also combining this hop with our latest YNS Challenge, which is to make a holiday/winter themed project. If you came here by way of Dana's blog, then you're on the right track! If not, please go back and start at Kerri's blog because you won't want to miss a stop! Because of this new release, Karen will have some bundle packs available plus an awesome variety of stamps in the YNS Bargain Bin and YNS Deal of the week so be sure to check out the store to take advantage of all the awesome deals! PLUS she’ll include a little something extra in every order from now until December 25th!! First up, I have a little tag meant to be tied to a Christmas present. I used the new Fancy Frame and Die set, and the To and From are both from the Holiday Snow Globe set. Isn't that fun?! I just hand cut another piece of white cardstock to serve as the backing for the tag and stamped the sentiment from the same set in the center. Lastly, I colored the little leaves with a green colored pencil. I used the super adorable Holiday Snow Globe set again, paper piecing the base from some wood-grained Basic Grey paper. The reindeer was colored with Copics and the shaker filling is faux Flower Soft and a little glitter. The sketch is from Sunday Sketch and Stamp. I hope you liked my projects and thanks for hopping along with us! Your next stop is the incredibly talented Jenny P..